The dust have settled after the world championship in Old School Mtg. 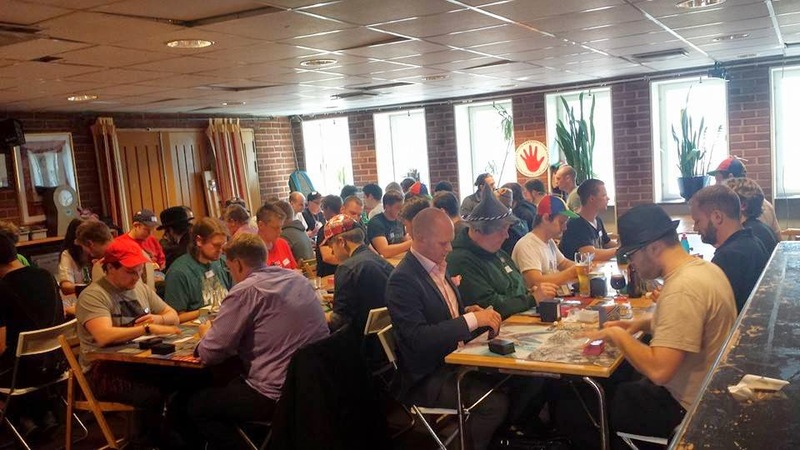 Forty-four players came to play nostalgic magic in a casual setting. We saw players with resumes ranging from a few years of kitchen table play to players with multiple success stories from the early years of the Pro Tour. There are many anecdotes to be told, but for now I'll let some pictures do the talking. Players gathering at the pub to chat and trade before the tournament starts. Burken, our glorious scorekeeper, at work. A mostly casual but skilled player, with a résumé that includes defeating Brad Nelson at Worlds 2010, which lead to the Player of the Year play-off for that season. I faced off against Danish player Jimmy in the first round. Doppelganger doing good work against the Meekstone. We had to get some extra tables to the pub and move around the furniture to make room for everyone. The last tables are in a sofa area. A lot of power in this room btw. These rad dudes travelled down from Arvika to show off a pair of really nice decks; UBR Sweetstuff and the Moss Monster deck (without Moss Monster). White Weenie having a hard time against triple Mishra and Abyss. Freespace, Elof, Kalle and Mg from Team 0-2 Drop showing off Lotuses. 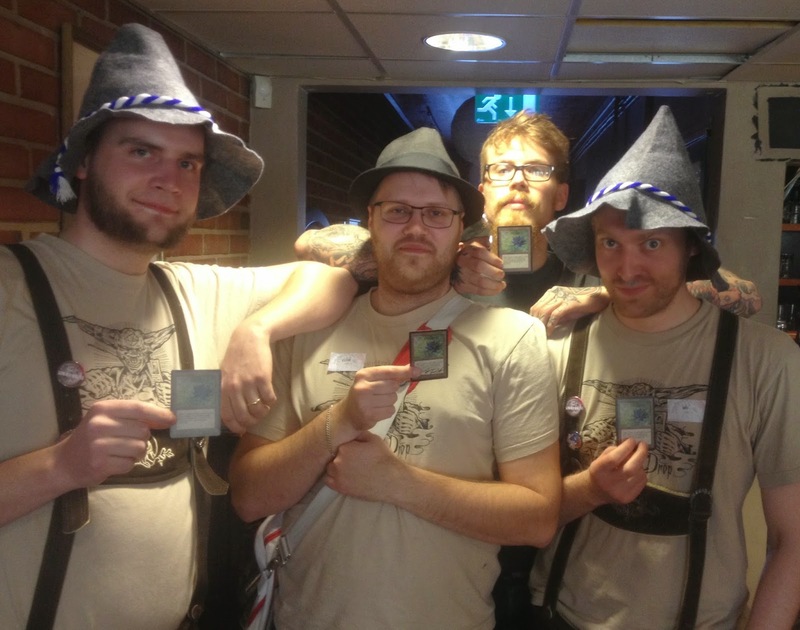 Hashi, Herr Glans, Anthrox and Jokemon from Team Kaffebryggers showing off an Oubliette. The Deck mirror. 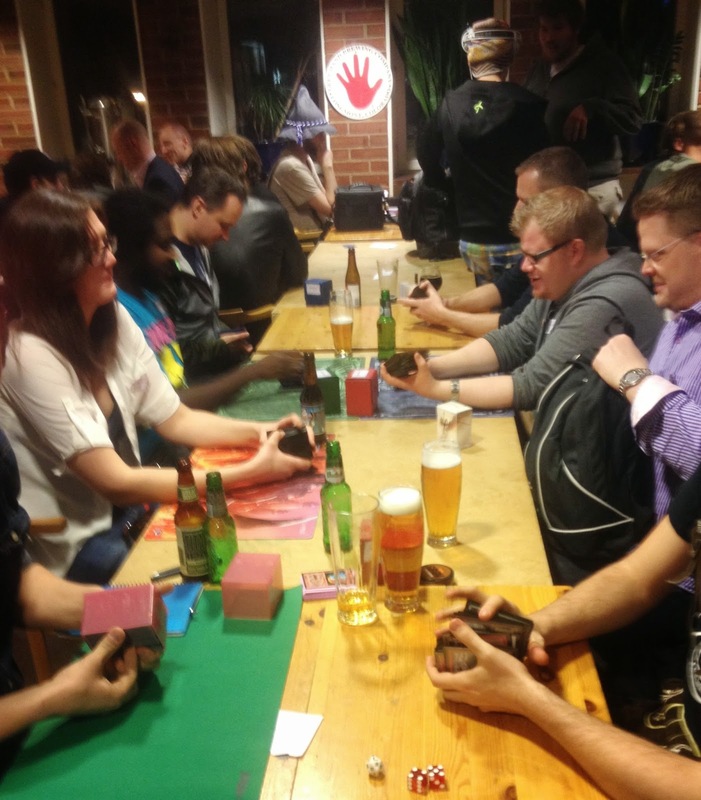 "The absolute best way to play Magic" -Åland. Kungen took his Kobold-less Kobold-deck to a 9th place. Timespiral's Black Weenie just resolved Hellfire against White Weenie. Honka playing WR No-Win against Goodstuff. 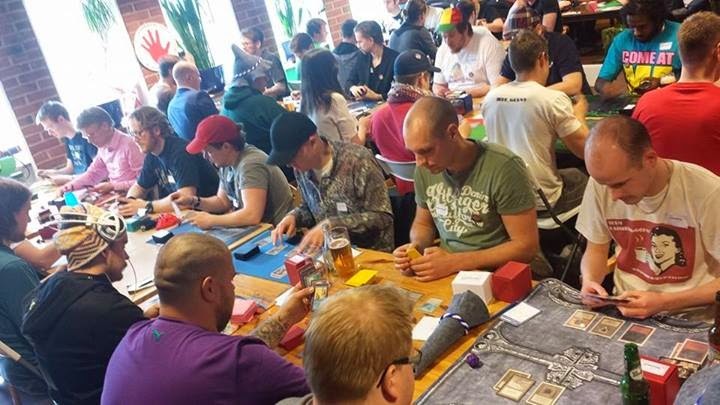 Shark-winner Robert Schram playing his first tournament since the restriction of Mana Drain. Looking sharp. Inquisition hits Balance and Alabaster Potion. Enchantress having an impressive board state against control. After the swiss, 20 or so players who didn't make it to top8 stayed and played a spontaneous side event (Huvudturneringen) for a signed Rukh Egg. One player have played two lands and a Howling Mine. Enchantress plays about half its deck, and wins with Channel Fireball. Magic! Robin, aka Hagelpump, finishes second after an impressive performance. Robin is no stranger to the n00bcon top8, and his Shivan Dragons took him to top4 last year. Stalin, the original founder of this blog, old national champion in Vintage, pimpvitational competitor, and 93/94 player since 2008 takes home the trophy and the Shark! Stalin used great Karma to his advantage during the entire tournament, and show that nice guys finish first! Stalin's 2014 World Champion deck. 4-off Electric Eel! Great day, great tournament and great people! I am so waiting for decklists from the top8, semmed like a lot of new and fun tech this year, and i agree on the Enchantress-build; it looks like a blast! Haven't got the list for the enchantress deck yet unfortunately. If I get it, I'll most definitly post it here. I've gotten mails with pics of 6 of the top8 decks now though (and quite a few other sweet decks). Keep the pictures coming! Looked like an amazing event; love seeing the pics.